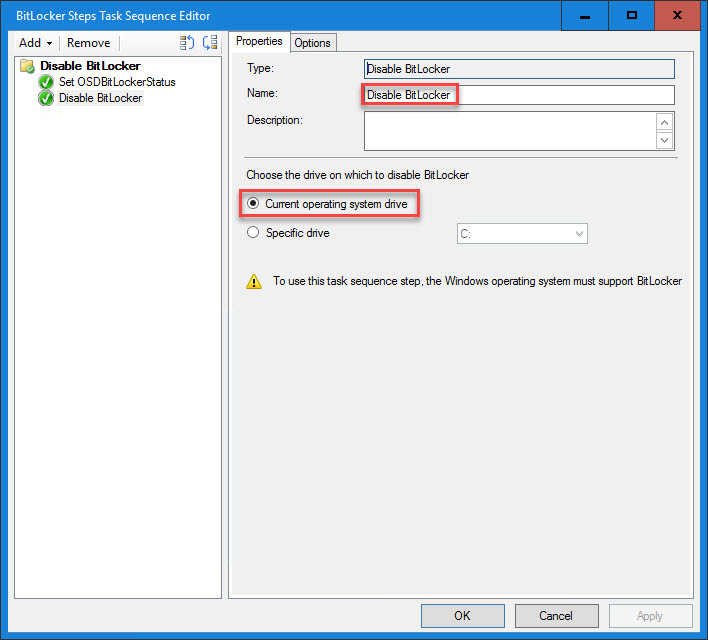 Disable BitLocker – this step will disable BitLocker encryption on the current operating system drive or one that you specify and runs in a full operating system (does not run in WinPE). It does not decrypt the drive, but it does leave the key protectors visible in clear text on the hard drive. This step only disables BitLocker for one reboot. This means that BitLocker will be enabled again after the restart. 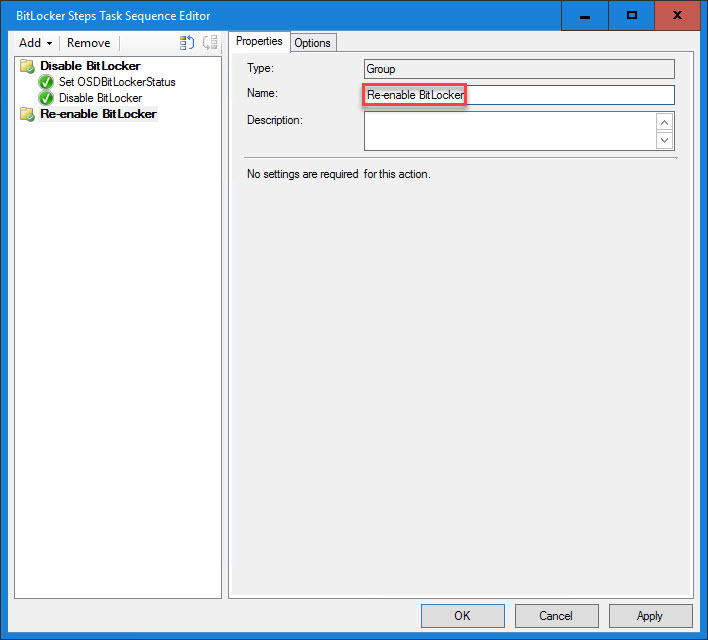 If you need BitLocker to be disabled for more than one restart, then you can use manage-bde with a Run Command Line step (see below). Also, if there are data drives encrypted, then they need to be disabled before disabling the operating system drive. 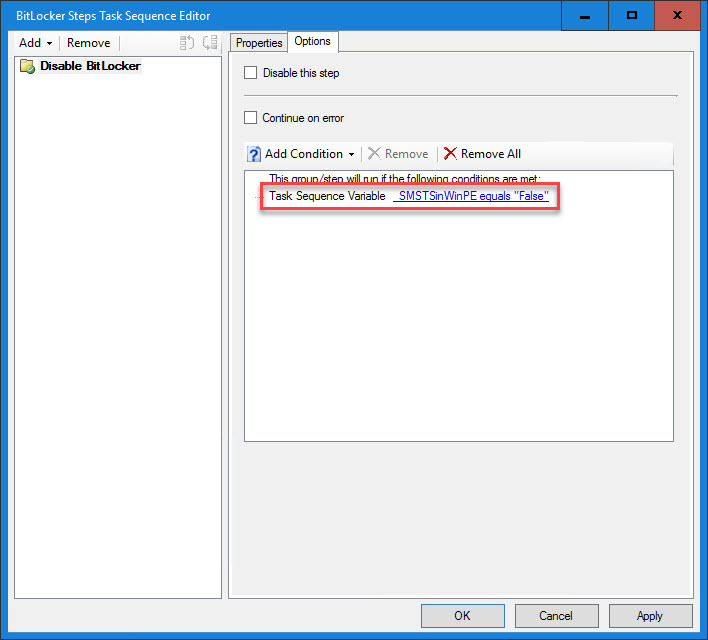 Note: before running MBR2GPT, BitLocker should be disabled. Also, for just a Windows 10 In-place Upgrade with BitLocker (not doing MBR2GPT), it is not required to disable BitLocker, however, there have been reports of BitLocker not being suspended long enough during the upgrade (see the link to Jonathan Conway’s blog below). 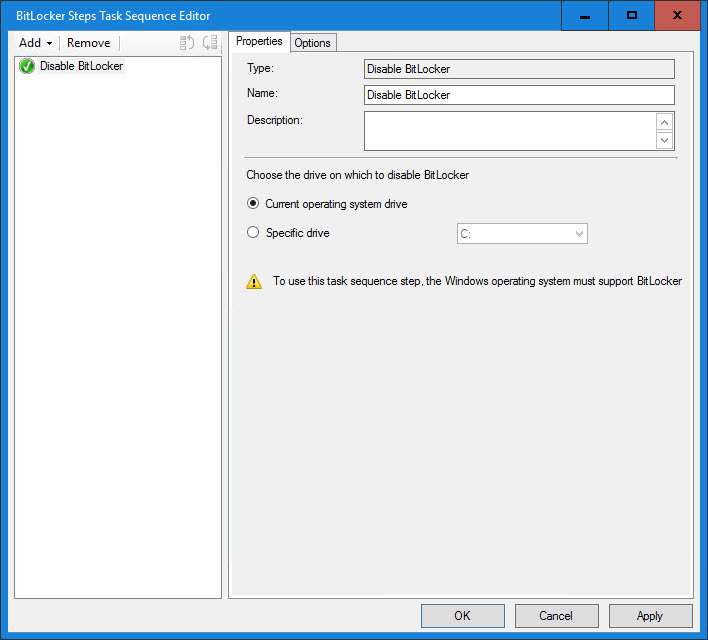 Enable BitLocker – this step will enable BitLocker encryption on a drive. It only runs in a full operating system (in other words, it does not run in WinPE). If selected for use, the TPM must already be enabled, activated, and allow ownership prior to running this step. 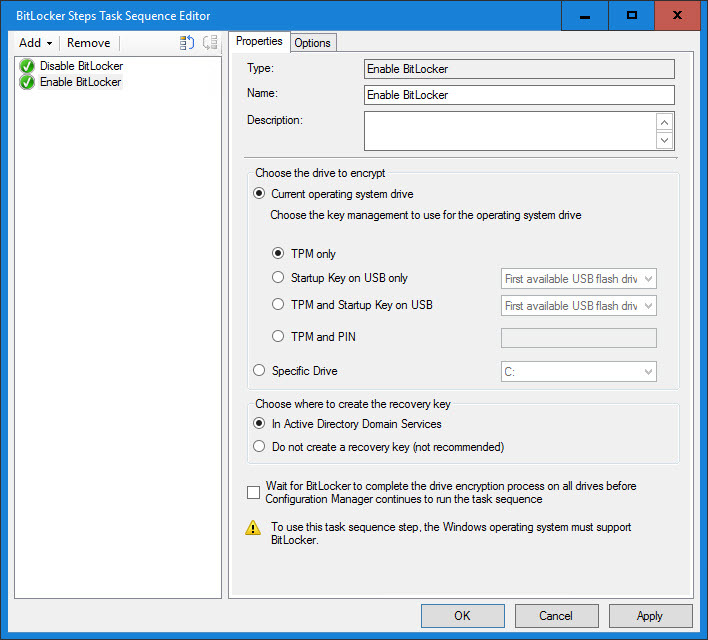 This step can be used to re-enable BitLocker if the drive is already encrypted with BitLocker but in a disabled state. 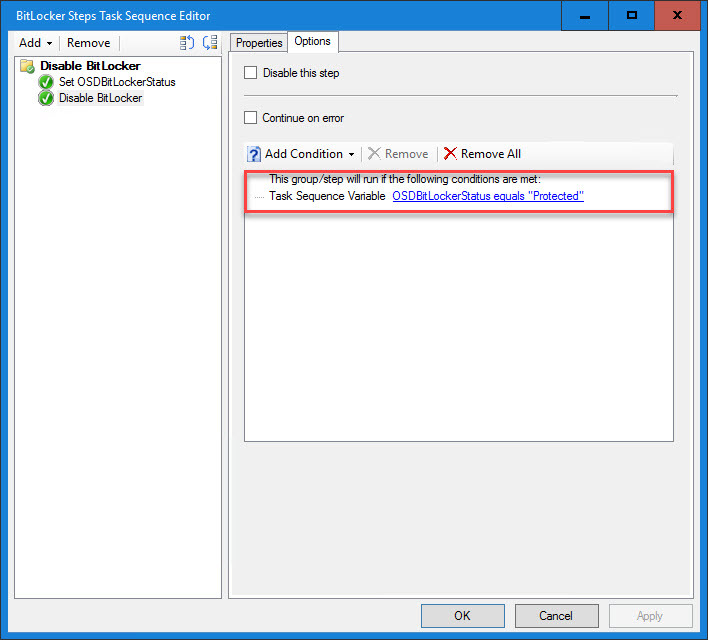 Pre-provision BitLocker – this step runs under WinPE (only) and is used to enable BitLocker during the WinPE phase of the Task Sequence. It also encrypts the used drive space, which makes encryption times faster. 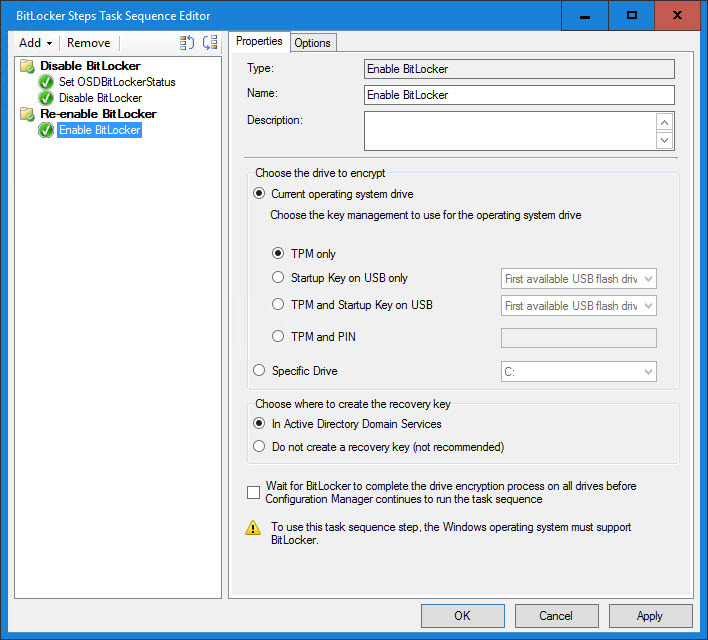 Once in the full operating system, use the Enable BitLocker step to apply the key management options. This step is generally be used in New Computer or Wipe-and-Load Task Sequences. 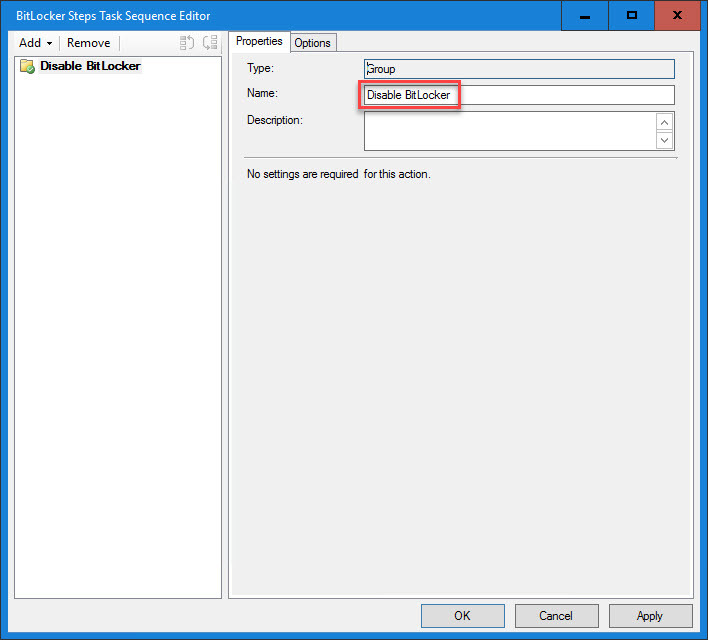 Manage-bde – this is a built-in command line tool that allows for the enabling, disabling, updating and reporting on BitLocker. The Microsoft TechNet documentation on Manage-bde is a bit stale and has not been updated to reflect some of the new capabilities that have been added in the newer releases. The most important one is the ability to control the reboot count when the protectors have been suspended. There is a new parameter called -RebootCount or -rc that takes a value between 0 and 15, where 0 suspends the protection indefinitely. 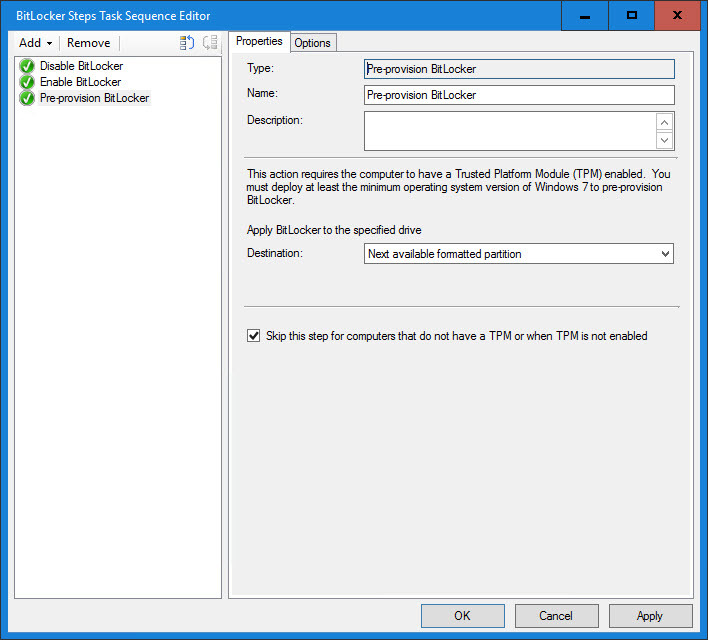 This can be useful if you have several reboots during a Task Sequence and you need to make sure that BitLocker stays suspended (optional method listed below). 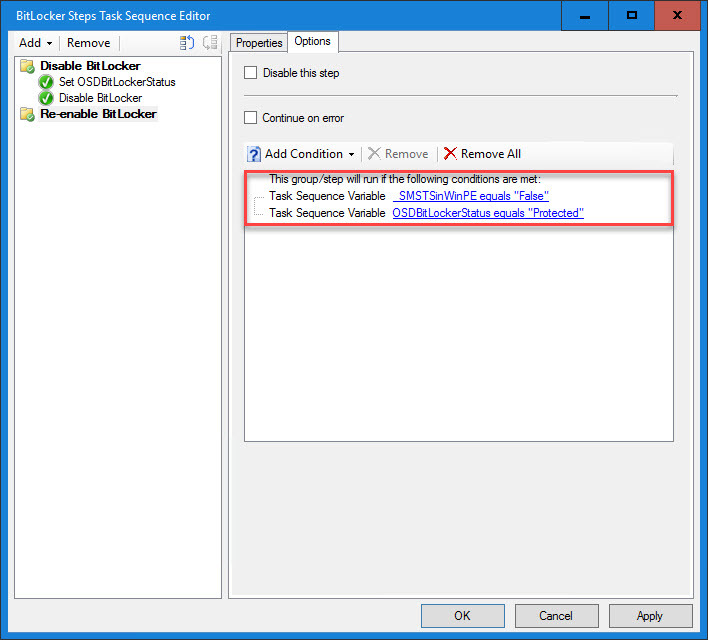 Note: Jonathan Conway has a great blog on how to use Manage-bde with the Task Sequence called SCCM Windows 10 Upgrade Task Sequence: BitLocker PIN Protector Issues on Laptops. 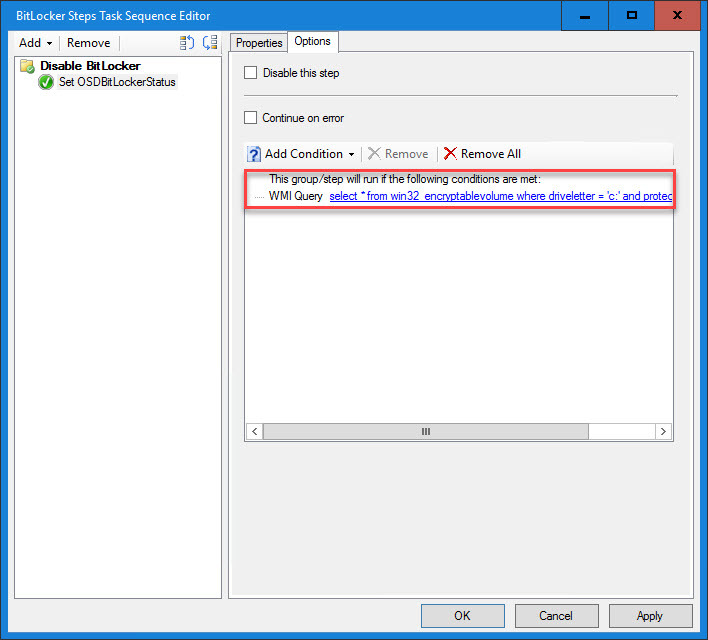 Place a Set Task Sequence Variable step in the Disable BitLocker Group and call it Set OSDBitLockerStatus for the name. 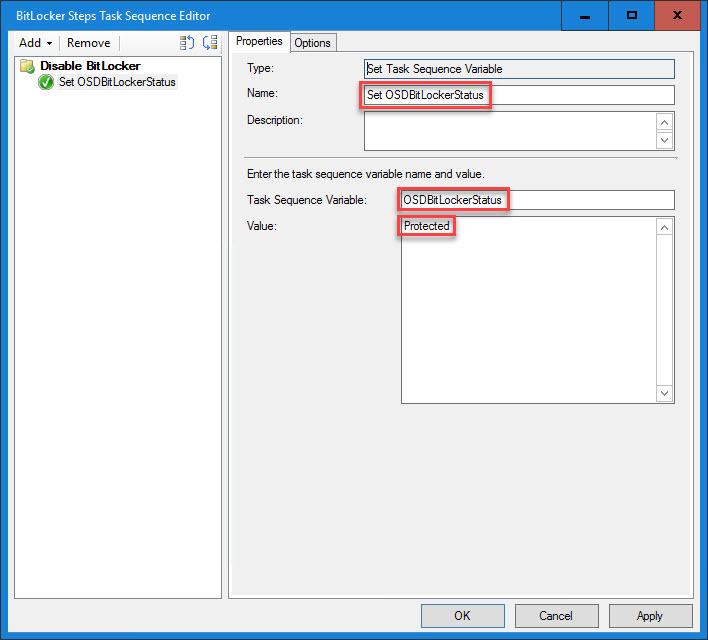 Enter OSDBitLockerStatus for the Task Sequence Variable and enter Protected for the Value. This will check the BitLocker status on the C: drive (which is hopefully the OS drive). 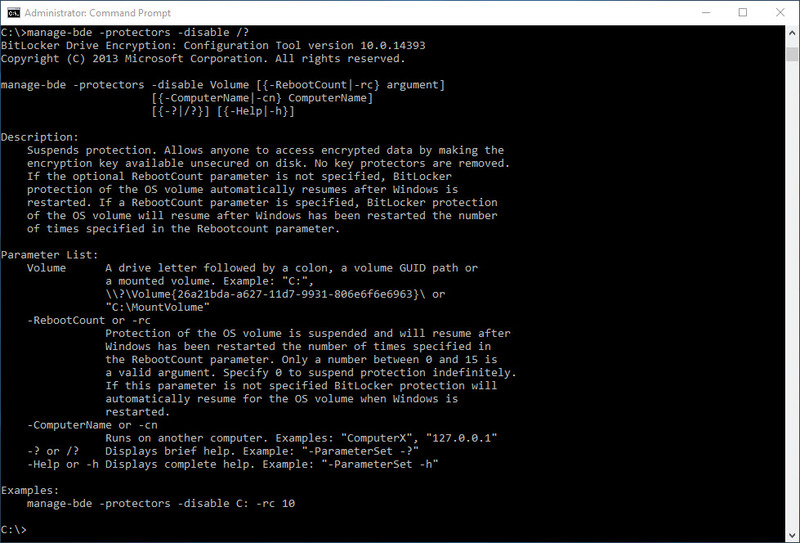 Keep in mind that if there are other data volumes that are BitLocker encrypted, these will need to be detected and decrypted first. Those systems can be filtered out in the collection targeting or it can be built into the Task Sequence using the same logic as above. Next, add a Disable BitLocker step (with the option set Current operating system drive). 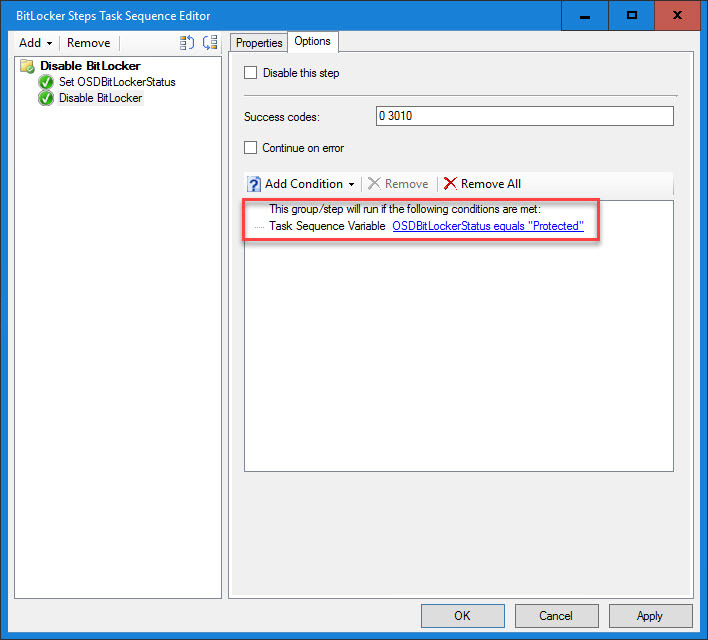 To re-enable BitLocker later on in the Task Sequence, create another group called Re-enable BitLocker. Next, add an Enable BitLocker step under the Re-enable BitLocker Group (with the option set Current operating system drive). Since the drive is already encrypted, this step will just re-enable the key protectors if they are currently disabled (like if you used managed-bde and specified a reboot count). 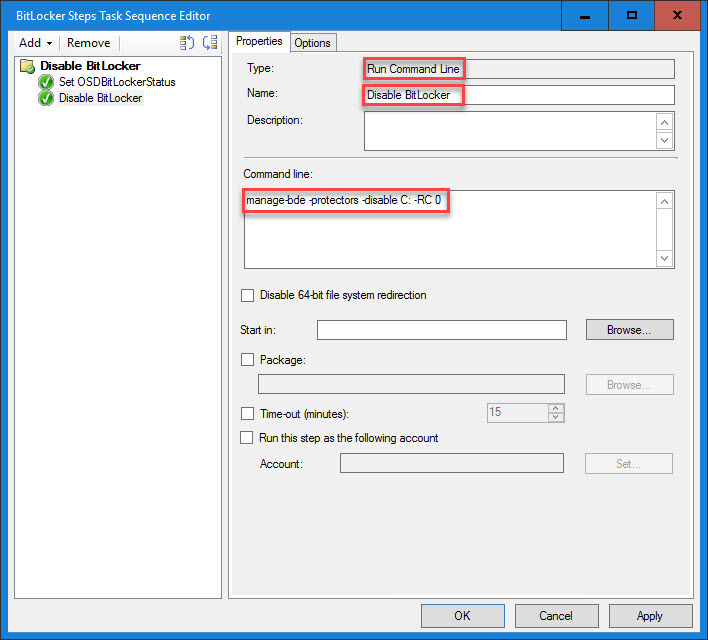 Remember that the built-in Disable BitLocker step will only disable BitLocker for one reboot (similar to what happens when you suspend BitLocker from the Control Panel applet), but if you used manage-bde with -RC 0, you will need to re-enable BitLocker. Keep this Task Sequence template handy so that you can easily copy and paste into other Task Sequences in the future. I will be referring to this template in upcoming blog posts.